New Queen’s nano-fabrication laboratory removes barriers to prototype development. Rob Knobel explains how the lab operates. The unique colour is due to how light in the lab is filtered. Steven Liss, Vice-Principal (Research), speaks at the opening of the Kingston Nano-Fabrication Laboratory. Graham Gibson peers through a microscope in the lab. The unique colour is due to how light in the lab is filtered. Janice Mady, Director, Industry Partnerships and Innovation Park, speaks at the opening of the lab. Graham Gibson explains how this micro machining system works. Rob Knobel speaks with the media prior to the opening of the lab. 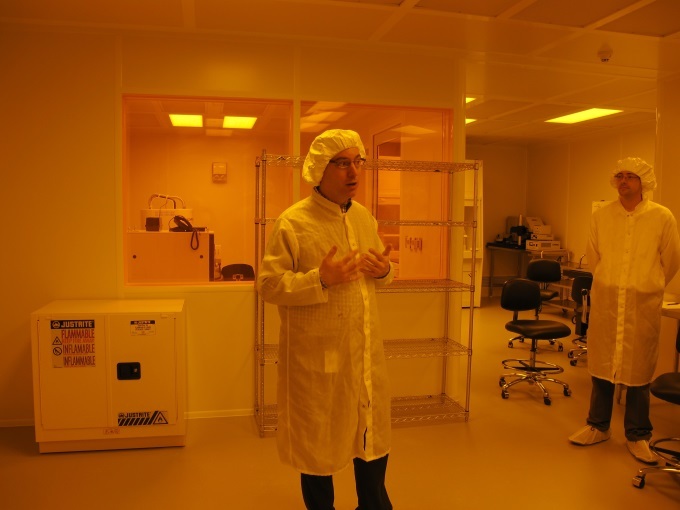 Queen’s University has secured its place at the forefront of transforming innovative research with the opening of the Kingston Nano-Fabrication Laboratory (KNFL). The laboratory enables researchers and industry to explore new frontiers in the design, creation and testing of innovations on an extremely small scale. The laboratory, located at Innovation Park, represents a milestone in the 30-year collaboration between Queen’s and CMC Microsystems for advancing Canadian strength in micro-nano innovation. Queen's PhD student Jennifer Campbell explains what the lab will mean for her studies. The KNFL’s highly specialized equipment and advanced expertise provide users with more automated, faster and cost-effective methods and processes for transforming innovative research into physical prototypes. Prototyping is an expensive but crucial step in developing the materials, components and circuitry that drive the future of technological innovation. This lab helps to remove a key barrier to advancing novel technologies to working prototypes. A key feature of the lab will be its participation in a national network that offers a repository of shared knowledge, enabling researchers to accelerate the development of their innovations, while generating new knowledge for up-and-coming innovators. The lab will also offer engineering services to researchers and companies looking to advance their technologies without having to do the hands-on work themselves. The lab also provides advanced training for students, who not only learn to operate highly advanced equipment, but also have the opportunity to explore its limitations and opportunities, enabling them to push the envelope on established manufacturing practices, potentially leading to better products and processes of value to industry. Partnering in the KNFL are Queen’s University, the Canada Foundation for Innovation, the Ontario Ministry of Research and Innovation and CMC Microsystems. The new facility expands Canada’s network of university-based micro-nano discovery labs and is part of Embedded Systems Canada, a $50 million, five-year project involving more than 350 university researchers at 37 institutions.